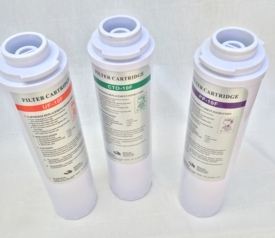 This filter set includes three replacement filter cartridges for the 3-Stage 3 Stage Ultrafiltration Water System. 1st Stage: 1 -Micron CTO Carbon Filter CTO-10F (replace every 6 months or 660 gallons); takes out most of the chlorine and organic matter. 2nd Stage:0.1 �Micron ultrafiltration membrane element UF-10F (replace every 6 months or 660 gallons); takes out most of particles and organisms larger than 0.1 micron in size and high molecular-weight substances, colloidal materials, and organic and inorganic polymeric molecules. 3rd Stage: 10 micron Post Carbon Polishing Filter T33-10F (replace every 12 months). This filter provides final polishing of water after the storage tank.